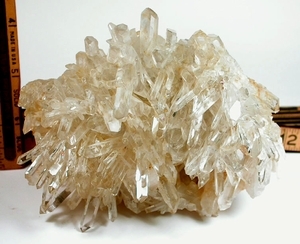 White gold porcupine style golden healer cluster radiates just AMAZING energy and is a showy large cabinet size of 4-3/8x 5x 3" high shown flat, with the tallest crystals at 2". Also sits up safely, as shown, on its' clean sandstone matrix. Densely intergrown clearly champagne yellow to clearly gem white crystals include rare needle crystals less than 1/8" wide! Plenty of rainbows, areas of natural iridesence, minimal natural regrowth - by far the most interesting feature, though, is a white, sugary second generation of 'brand new' quartz overlay. Collier Creek, Montgomery County, Arkansas. This cluster will be shipped doubly-boxed in soap powder to ensure it arrives at your door with no further damage than the three points with fleabites! Handwritten description on the reverse of our enclosure card will of course be sent also. Shipping will be added.